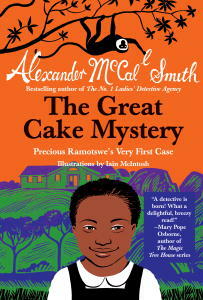 I was so excited to hear that Alexander McCall Smith had written mystery chapter book for younger readers featuring a young Precious Ramotswe of The No. 1 Ladies’ Detective Agency. My daughter and I got through The Great Cake Mystery in record time, she loved the story and the illustrations by Iain McIntosh. Precious Ramotswe is the founder of the fictional No. 1 Ladies’ Detective Agency in Botswana, Africa and the series for adults is charming — it is like a little vacation for me when each new book comes out. You don’t have to have any prior knowledge of the characters from the adult series, however, to enjoy this wonderful book. The first two chapters follow Precious and her father as he retells a story to her of when he faced a lion in his village. He ultimately escapes the lion by making him sneeze, waking up the other villagers who bang on pots and pans to scare the animal away. At the end of her father’s story he mentions that “It’s well known that if a lion eats a person who’s feeling cross at the time, he gets indigestion.” Precious tells her father she doesn’t believe the final part of his story and he places the seed in her mind that she could become a detective someday. Precious’ chance to find out if detective work suits her comes sooner than one would think when a slice of cake, toast with jam, and sticky buns go missing one by one at her school. The other children are quick to accuse a boy who has a fondness for sweets but Precious does not think it is fair when no one has proof. I really liked the theme of not believing a serious accusation just because everyone else has decided to place blame. She discovers that monkeys are the culprit but it takes a vivid dream to help her figure out the solution. Spoiler alert: the monkeys aren’t harmed, they are just caught in the act of trying to take a cake she made just for them and her schoolmate is vindicated. When I asked my 3-1/2 year old daughter what her favorite part was, she said, “I like how Precious made the monkeys a sticky cake” and then asked to read it again. I think that considering the book is fiction no one will run out and put glue in a cake and the monkeys are cleaned up and return to the trees after being caught sticky handed but I wanted to mention those details in case they’re of concern. The vivid illustrations are done in oranges, grays, and blacks — featured just often enough to keep a young reader’s interest. There are pronunciation guides that I found helpful as well as discussion points to raise when the book is over. My daughter was transported to a world where lions and monkeys can live just outside your door and I think she really enjoyed hearing the mystery unfold. Often if a story includes lions and monkeys they’re set in a city with a zoo so I found the setting refreshing for little ones. Additional notes: There is a point where eggs are illustrated as a cake ingredient and a recipe in the back for sponge cake is not vegan. Cattle farming (a big part of life in Botswana) is referenced at one point as well but all these things make sense contextually. The 73 pages can be read aloud in an evening or two and the author’s note mentions that the book was specifically written with the under 10 set in mind. I am always on the lookout for good chapter books with admirable heroes and heroines and if my review doesn’t convince you to check this one out, the cover includes a positive quote from Mary Pope Osborne of The Magic Tree House fame. Let us know in the comments: Have you discovered any great chapter books for younger children lately? I recently reread Bunnicula to my daughter. It was a favorite of mine as a kid, and it works very well as a read-aloud! Review coming soon.